Defining multiple methods with same name and same signature in super class and sub class known as method overriding. When Overriding a method there is a chance of having statements which may cause exceptions so we need to handle those inside method. Otherwise simply we can give responsibility of handling exceptions to calling method. We can give the responsibility of handling exceptions of a method to calling place by using throws keyword in java. Now we are going to discuss about exception handling in method overriding in java. When am method is overridden in sub class and super class method having throws exception. Then we have some scenarios to discuss. 1.Super class method not throwing any exceptions. 2.Super class method throws exceptions. We can add throws unchecked exception in sub class overridden method. We can not add throws checked exception. Program #1: When super class method does not have any throws exception then we can add throws un checked exception in subclass overridden method. Program #2: When super class method does not have any throws exception then we can not add throws checked exception in subclass overridden method. 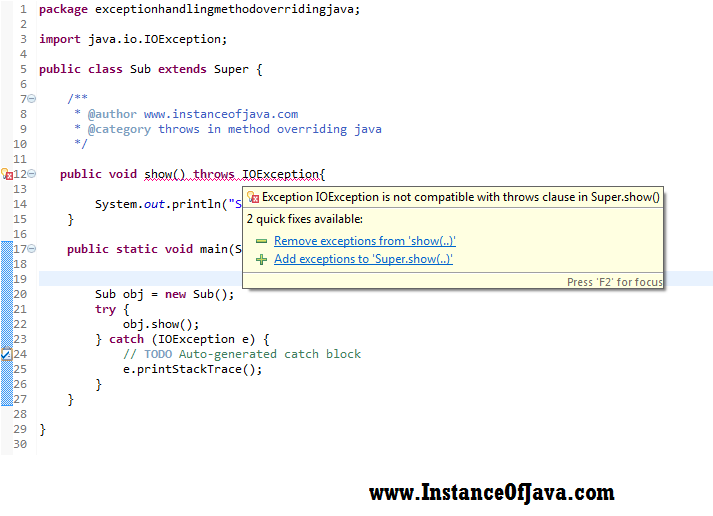 If super class method throws checked exceptions sub class overridden method can throw same exception , sub class exception or no exception but can not declare parent exception. If super class method throws unchecked exceptions then no rules. 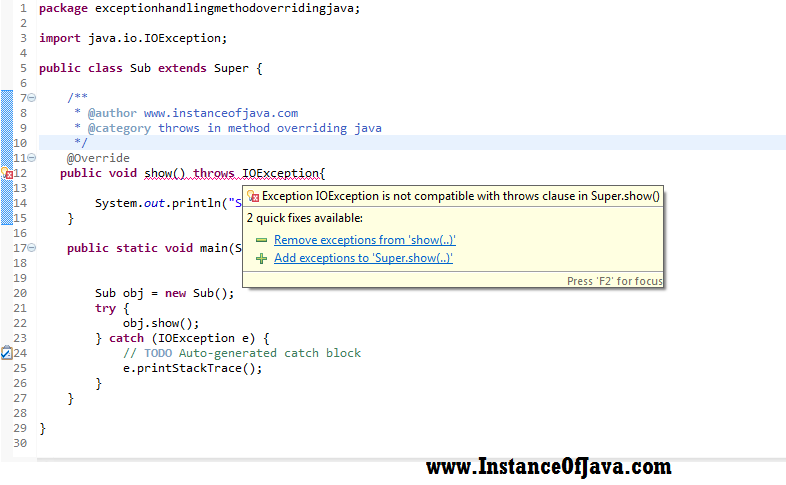 Program #3: When super class method throws checked exception then we can add throws checked exception in subclass overridden method. Program #4: When super class method throws unchecked exception then we can not add throws checked exception in subclass overridden method. Program #5: When super class method throws checked exception then we can not add throws its parent exception in subclass overridden method.